Recycling is now something I do as easily as throwing something away. I didnt really think about needing to have its own bin until my son became the ever curious explorer. I used to have a bag that sat next to the garage door for things like milk jugs, cans and water bottles. Now that he gets into everything and please dont touch is something he thinks is funny I knew we needed a better solution. Rubbermaid makes all sorts of great everyday products, so much more than food containers. I like the variety of products they make for recycling needs. The Rubbermaid Hidden Recycler is perfect for hiding the stuff I need to recycle and can keep my son out of it. It is simple to install and easy to use. I usually take out the recycling each day as I clean up the kitchen for the night and with the Rubbermaid Hidden Recycler I can grab it by the handle. This has made it easier to recycle items as I use them without having to worry about my son getting into it. I really like the new Stackable Recycler from Rubbermaid too. It would be great for the garage. Being organized is a great way to start off your Spring Cleaning. If you know what you have and where it is I find it to be much easier to keep things clean. A Rubbermaid Hidden Recycler for your home. 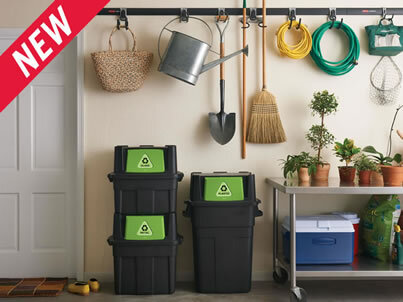 What other product from Rubbermaid would you like to have? *Limited to US residents; 18 years old and above. Giveaway starts April 7, 2012 and ends on April 25th 2012 at midnight PST. Winner will be emailed and has 48 hours to respond before another winner is selected. I was not paid for this giveaway or post. I was provided the item reviewed in this post for free by the company or PR company that represents them. The opinions on this item are 100% mine and may vary from others. The sponsor is responsible for providing the prize. I would luv a Resin Cabinet! i would love to have the bento storage boxes!!! I would like Microfiber dust mop. I would like to have LunchBlox Sandwich Kit! A perfect addition to recycling. I like your fan page on fb: A marie hj saver is my fb name. I also like rubbermaid on facebook as A marie hj saver.